This is a Textile. It was designed by Akira Minagawa and made for minä perhonen. It is dated 2004 and we acquired it in 2018. Its medium is foundation 54% cotton, 46% silk; embroidery 100% cotton and its technique is embroidered on plain weave. It is a part of the Textiles department. Akira Minagawa opened his first minä perhonen fashion boutique in Tokyo’s Shirokanedai district in 2000, and began showing his collections in Paris in 2004. Forest Parade, introduced as part of the Spring/Summer 2005 collection, has become an iconic design for the brand. “Perhonen” means butterfly in Finnish, and this design includes butterflies, birds, flowers, branches, and the word PEACE among its thirty-seven three-dimensional embroidered motifs. The individual lace motifs are embroidered on a water-soluble vinyl substrate, which is dissolved away. 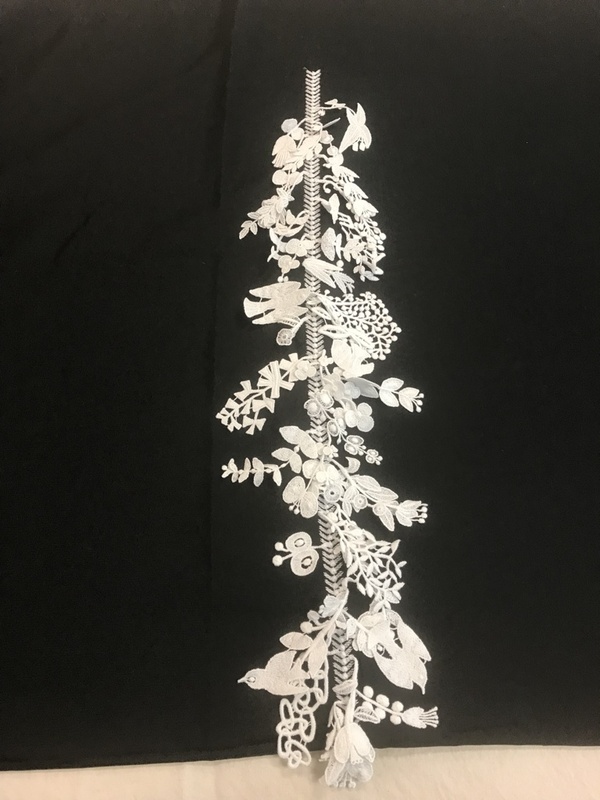 They dangle and swing from a central column of embroidery down the front of a dress, harking back to the traditional use of lace in cravats, jabots, and other cascading neckwear where details blur in an overall feeling of depth and movement. This object was donated by minä perhonen. It is credited Gift from MINA CO., Ltd..